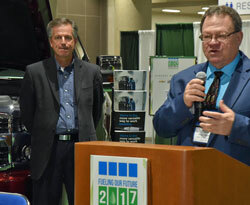 U.S. auto manufacturers have introduced a record number of new biodiesel capable diesel vehicle options, several of which were on display at the 2017 National Biodiesel Conference Vehicle Showcase, presented by NBB and General Motors Fleet. One of GM’s flagship models, the 2017 Chevrolet Silverado HD pickup with a 6.6L Duramax® turbo diesel engine, is on proud display in the vehicle showcase, while Ford Motor Company is also showcasing one of its new 2017 B20 capable pickups and Nissan is displaying the Titan XD powered by a Cummins® 5.0L V8 turbo diesel engine. The showcase also features the John Deere 5045E with a PowerTech® turbocharged diesel engine approved for use with B20 biodiesel blends. John Deere was one of the first original equipment manufacturers (OEMs) to get involved with biodiesel, approving B5 biodiesel blends for use in its engines in 2001. 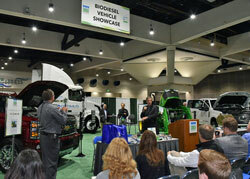 “NBB and the U.S. biodiesel industry remain committed to working closely with our partners in the auto and engine manufacturing community to ensure that the high quality biodiesel fuel of today and tomorrow will continue to provide OEMs, fleets, and consumers with a reliable, fit-for-purpose fuel that keeps pace with the nation’s increasing demands for cleaner, more efficient, and sustainable modes of transportation,” said NBB Senior Technical Advisor Steve Howell. Also on display is a commercial truck that runs on B100, thanks to Optimus Technologies which has begun to manufacture biodiesel conversion systems that enable vehicles to run up to B100—even in the coldest climates.